What Is DA Form 3643? DA Form 3643, Daily Issues of Petroleum Products is a form used for recording the receipts and issues of petroleum products from and to Army vehicles. The vehicle U.S. Army number or tail number must be recorded on the form. The latest version of the form - often incorrectly referred to as the DD Form 3643 - was released by the Department of the Army (DA) in April 1985. An up-to-date DA Form 3643 fillable version is available for digital filing and download below or can be found through the Army Publishing Directorate website. The public distribution of form is unlimited because the information on it does not require any special protection. How To Fill Out Da Form 3643? EDITION OF 1 OCT 70 IS OBSOLETE. 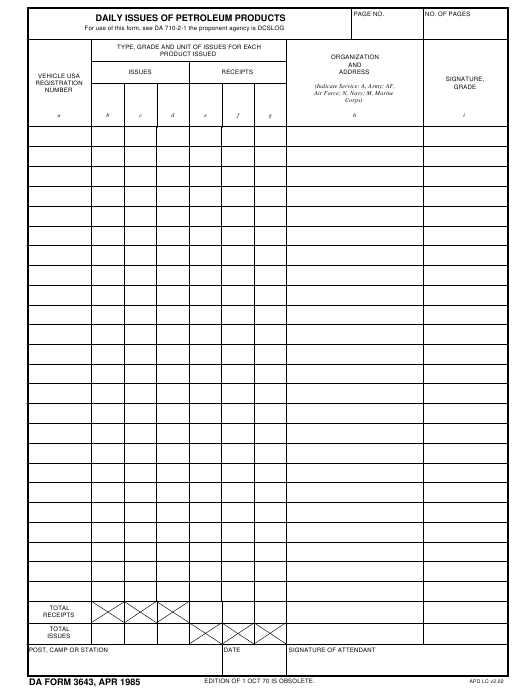 The top line of the form should contain the number of each page and the total number of the forms used as a pack in a day. The very left column - Column A - is for US registration number of the vehicle. It is necessary to provide the registration number for vehicles being refueled for retail issues. A U.S. Army number of nomenclatures of the consumable item of equipment should be entered for individual containers. Bulk issues and receipts require the document number. Columns B, C and D - Issues - and Columns E, F and G - Receipts - are for indicating the type of fuel, unit of issue and the quantity of fuel issued or received. Column H - Organization and Address - is for the organization and address of the unit receiving the fuel. Column I - Signature, Grade - requires the issuing (or receiving) soldier's signature and grade. Lines for total issues and total receipts are at the bottom of the form. The box for the post, camp or station requires the name of the location. The attendant issuing and receiving the fuel should sign the DA 3646 in the corresponding box for the form to be completed.